Something has been missing here in Tallahassee. Good ole' local BBQ served with a smile and priced so you can come as much as you want. No servers here. Just come on in, pick yer meat, pick yer sides, pick yer bread, get your drink and have yer food in minutes. 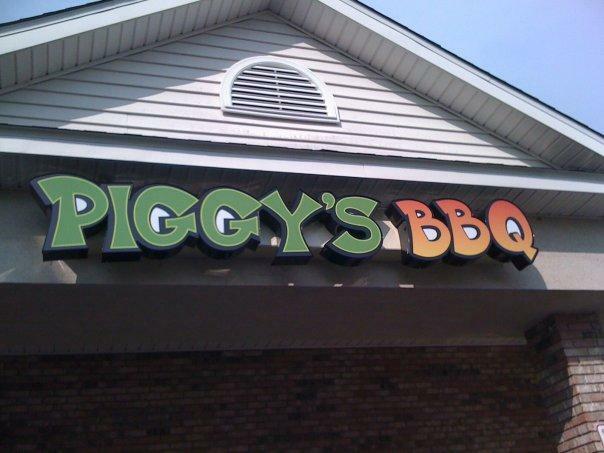 You just need to talk with Piggy's owner, Brian Rowe, for 5 minutes to realize just how passionate he is for BBQ. He'll introduce you to different types of flavor, explain what makes a great brisket taste soo good, what regions of the country are known for what types of sauce, and why ribs that "fall off the bone" actually aren't as good as ribs that stay together until you take a bite and then fall off clean in your mouth. Appetizers: If You're Eatin' Bbq, There's Bound to Be Some Sharing. Our Appetizers Are a Good Way to Get the Plate-Passin' Underway. Bbq Sandwiches: Make It a Big Deal: Add a Sidekick and a Soft Drink to Any Bbq Sandwich for Just 3.00. Signature Bbq | Pork: the Original and Still All-Around Favorite. Lean Pork Shoulder Slow Smoked for Up to 12 Hours. All You Can Eat $3.00. Signature Bbq | Ribs: Tender, Fall-Off-the-Bone Ribs Prepared in a Variety of Styles, All of Them Delicious. with Two Sidekicks and Garlic Bread Or Homemade Cornbread. Signature Bbq | Chicken: All-Natural Chicken, Slow Smoked for Hours to Give It That Signature Sonny’s Flavor That’s Craved Across the Nation. Garden of Eatin': Meat-Eaters and Leaf-Lovers Can Both Agree That Our Salads Are Delicious. with Or Without Slow-Smoked Favorites On Top. Desserts: a Little Something Sweet Is the Perfect End to Any Meal. Our Desserts Are Made in House Using Original Recipes and Fresh Ingredients. Sharing Is Optional. Kids: Served with One Sidekick and Choice of 2% Milk Or Fruit Juice. Children Under 10 Years of Age. Dining Room Only.